Your horse's digestive system is complex, and issues can easily occur in any part of the gut. One of the biggest concerns for horse owners is colic - and it is no wonder given that a study by the Morris Animal Foundation has shown that colic is the number one killer of domesticated horses. 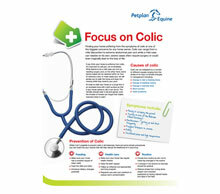 To help allay your fears around colic, and other issues that can occur in the horses gut, read all about how to help prevent and diagnose colic in the free guide to colic below and get a closer look at your horse's gut.